Fabricating TRUTH is a metaphorical Pandora's box about the current 45 administration. Until Trump was elected, I considered truth an absolute. No longer! This piece, "Fabricating TRUTH", is like a Pandora’s Box that has been opened, releasing three bracelets, titled, Alternative Facts, Web of Lies and Circular Logic. The construction of each bracelet symbolizes the current administration’s factually untethered actions. On Meet the Press Sunday, August 19, 2018 Rudy Giuliana (Trump's lawyer actually said, "the truth isn't the truth. This artwork from 2017 gets better all the time. Another example from earlier in 2018 is how Trump continues to invent facts. This quote (below) is from an article from the The New York Times titled "Trump Repeats False Claim About Trade With Canada"
"Mr. Trump's private admission to having a loose grasp of the facts and his public refusal to back down from the incorrect statement - the United States has an overall surplus in trade with Canada - were vivid illustrations of the president's cavalier attitude about the truth, and a reminder of how that approach has taken hold at the White House." The Pandora's box of TRUTH is open. Jewelry has a long history of symbolism in political arenas. The inauguration and the subsequent Women’s March caused me to realize that it was important to give a visual voice and identity in support of those who stand up and resist. In the months it took to fabricate this box and the three bracelets, it occurred to me that I was “Fabricating Truth” and recognized the ironic comparison to the 45 administration that twists rationality and constructs their own warped views without foundation or concern for truth. RESIST! Alternative Facts Bracelet is an insubstantial construction. The lettering is cut from recycled tin cans printed with Nutrition Facts. So much information these days has little foundation in the truth, yet it is bent and presented as fact. Web of Lies Bracelet is fragile construction which is gold plated to reflect the current 45 administrations illegal, unethical, and immoral application of the truth. Circular Logic Bracelet is hard to read. It is impossible to understand what it says, "Circular Logic." This is a metaphoric construction for the circular logic and responses from the current White House. Fabricating TRUTH will be shown in the exhibition "Crafting a Legacy" at the National Ornamental Metal Museum. Ever since the presidential election of 2016, the concept of truth (which I considered an absolute) has been bent. Since when is opinion equal to fact? What happens when the presidential administration fabricate the truth? What does it say about our current government of the United States bends and undermines the facts from moment to moment. From the podium of the president we hear alternative facts, a web of lies, and circular logic. Science, and logic dismissed. Long term values of the United States including religious tolerance and a sanctuary for immigrants are questioned. I am not the only one examining the concept of TRUTH. The New York Times recently adopted an unofficial slogan, "The TRUTH is more important now." Truth is a concept that is often examined closely, but it hard to define. The embroidered sampler (Ieft photo) from the 19th century was most likely sold as a kit for developing needleworking skills and then displayed at home. It illustrates that friendship is built on truth. Truth and honesty were highly valued attributes of politics and personal accountability in the 19th century. "Honest Abe" is just one example. The California Fruit crate label (right photo) from the early 20th century was designed as product identity for Sunkist oranges. Here TRUTH is used as a concept to represent a quality product. This vintage fruit crate label was the inspiration for my Fabricating Truth Pandora's box. A recent article from Time Magazine by a Wall Street Journal writer Bret Stephans describes trust within our current politics. "When you work at The Wall Street Journal, the coins of the realm are truth and trust — the latter flowing exclusively from the former. When you read a story in the Journal, you do so with the assurance that immense reportorial and editorial effort has been expended to ensure that what you read is factual." "Not probably factual. Not partially factual. Not alternatively factual. I mean fundamentally, comprehensively and exclusively factual. And therefore trustworthy." Why is jewelry contained within the Fabricating TRUTH Fruit Crate? Jewelry has a long history of a symbolic role in political activism. The most significant example of Suffragette jewelry was the Holloway Brooch designed by Sylvia Pankhurst around 1909. It is a square grid that is supposed to represent the portcullis symbol of the House of Commons, England. It has the silver gate and hanging chains. On the center is a enameled arrow in purple, white and green. It was "first presented to ex-suffragette prisoners at a mass demonstration at the Albert Hall on April 29, 1909." Another example of politically symbolic jewelry is the iron jewelry from 19th century jewelry (shown below left). As Prussia was in an extended war against Napoleon they asked the patriotic citizens to donate their gold jewelry to the national coffers and were given iron jewelry as a replacement. This non-precious iron jewelry symbolized their patriotic donation to the war efforts. The V for Victory Brooch was popular in the USA as WWII started. A laminated three color bar pin top suspends a large carved red V. (center) This original Bakelite pin was most likely red, white and blue but the Bakelite plastic has aged, changing color over time. It is a classic collectible representing political jewelry of the mid-20th century. What is more symbolic of an individuals allegiance to the anti-war protest movement of the late 1960's than when the peace sign was turned into pendants and earrings. 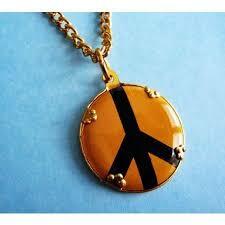 During the 1960's peace sign jewelry (right) was an anti-government protest against the Vietnam war. Fabricating TRUTH in the news. RESIST! I am thrilled to say that TRUTH is featured on KQED arts website "100 Days of Trump." (This is San Francisco's PBS station.) Read the post, "Fabricating ‘Truth,’ One Tin Can Bracelet at a Time" based on an interview by Creo Noveno. 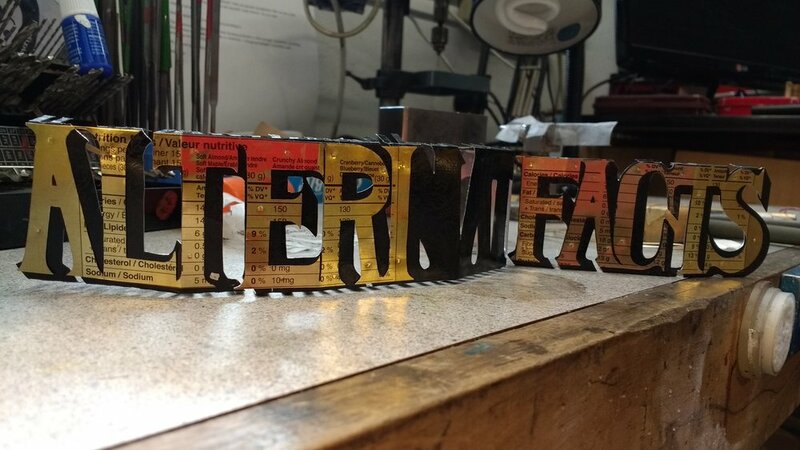 Alternate Facts and Web of Lies Bracelets (both in progress) were featured on the CNN website "How artists are marking Trump's 100th day in office." This was a totally thrilling opportunity to share my work with a larger audience along side paintings and photography of other political artists. To put this in perspective, while I marched on the streets of San Francisco in the Climate March, and my work is shown on the CNN website, our 45th president was visiting my hometown of Harrisburg, Pa. in a "political rally" of support for his political agenda. RESIST! Our work is not done. The ALTERNATIVE FACTS bracelet started with a drawing for cutting out the metal. This was drawn and redrawn on tracing paper (shown above.) Then it was glued to the recycled tin cans. The photo left shows the ALTERNATIVE FACTS bracelet in progress (shown in the left animation.) The insubstantial construction of this bracelet is a metaphor for the rhetoric of the 45 administration that is based on lies, and half truths. Each one of the letters is cut from recycled tin cans. Above is the lettering attached to the background shadow. In the photos below, I am cutting out the top of the bracelet. It is supposed to be a metaphoric "web of lies." The first photo is the beginning of the piercing. Each photo shows further progress. Each section in the "web of lies" has to be cut out separately. This takes a great deal of time and skill. The threads of the spider web were very thin. I worked on cutting out the spider web in brass for weeks. Alternative Facets Bracelet in progress. The top is a "web of lies." FACTS is ready to attach to the side. Alternative Facets Bracelet and the Web of Lies Bracelet (shown above) are almost finished. The top is a spider web. I thought that the "web of lies" would be the bottom, but then changed my mind. I put the spider web on the top, and made a black bottom from black recycled tin cans for better contrast. New photos will be posted in about three days. These bracelets are taking a very long time to fabricate, close to six months. These bracelets are featured on CNN website: "How artists are marking Trumps's 100th day in office" by Shahar Peled, CNN. Web of Lies Bracelet was cut from flat brass sheet. I drew the design to make the lettering to look like an abstract web. Usually, I work exclusively with recycled tin cans, but tins would not have been strong enough to cut away most of the material. In this example, the idea that the 45 administration was a "web of lies" was more important to realize. After cutting out the "web of lies" graphic, I added a metal frame to add strength to this delicate bracelet. That took weeks in itself to float the "Web of Lies" in the center exactly right. In the photo below, I am soldering on the frame. Artist Harriete Estel Berman soldering the frame around the Web of Lies Bracelet (above.) This frame was a lot more work but it will add structural integrity to the thin bracelet, and on display the cut out lettering will float above the pedestal. Web of Lies Bracelet is almost done. On Wednesday June 14, I will be gold plating this at Monsen Plating in Berkeley, CA. Margot Plagemen, my studio assistant cutting out the Circular Logic from recycled tin cans. This took over two months because she works 4 - 8 hours a week, and other work with deadlines has to come first. Circular Logic was cut out of recycled tin from a "LOST" Game tin three times. It was over 48" long. Harriete Estel Berman hammering Circular Logic Bracelet with a raw hide hammer. Harriete Estel Berman bending the Circular Logic Bracelet round in the studio. Testing the Circular Logic Bracelet shape. From the very beginning I wanted it to be round or circular, knowing it would be hard to read. This is a metaphor for the fact the the 45 administration logic is imporssible to understand.